Professional Results from a rental machine! * 60 psi pump blasts cleaning solution into your carpet with twice as much pressure. * 107 water lift provides powerfull suction and faster drying. * Professional quality products to remove soot, stains and pet accidents! * One ounce (detergent) per gallon, vs. four to five ounces. * Smooth nozzle that does not tear your carpet. In its simplest form, a carpet extractor puts down soapy water and then pulls it back up. Many extractors also offer some form of agitation (hopefully of the carpet, not the user). The results obtained depend on how well the machine does each of these things. 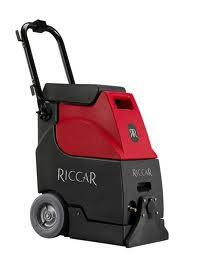 Since it was designed for commercial use, the Riccar unit has a commercial quality pump and vacuum motor. These did an excellent job of spraying cleaning solution across the entire width of the machine and then of vacuuming up the solution to allow for fast drying. However, the biggest advantage of our machine seemed to come from the machine‘s brush agitator used to clean the carpet. It’s much like your upright vacuum brush roll and did wonders getting dirt out of the carpet. Both on the wall to wall plush carpets and thinner area rugs, the results were easy to see (even if you didn’t see the dirty water). Compact extractor maneuvers well in small commercial areas with tight spaces. This is our smallest and lightest self-contained carpet extractor. Simple-to-use controls and a handle-mounted solution control make operation a breeze. 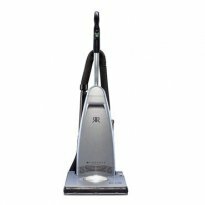 If your vacuum just doesn't do the job and you need it done now we have vacuum cleaners available for rent.